This year fall derby Ambush at the Lake will also be ending today. We had a great turn out and I would like to thank everyone who joined the derby for a chance of $6000 in resort prizes. As of Saturday morning we had 90 qualifying fish checked in at the general store. We will be giving away 60 prizes in a raffle involving angler that checked-in a qualifying 14" or better fish. I'll have the results posted on the website and I'll be snail mailing the winners by the end of the month. Mark your calendars for next year's derbies. Below in this email is the 2015 Derby Schedule. It's been fun writing up the weekly fishing report this year and I'm looking forward to starting up again next April. Enjoy the winter and remember we are open all year at Convict Lake Resort. Check out our great winter lodging special. There is still a lot going on in the winter; fishing, skiing, snowshoeing, sledding, snowmobiling or just sitting by a fire enjoying the peace & quiet as the snow slowly builds up on the window sill. 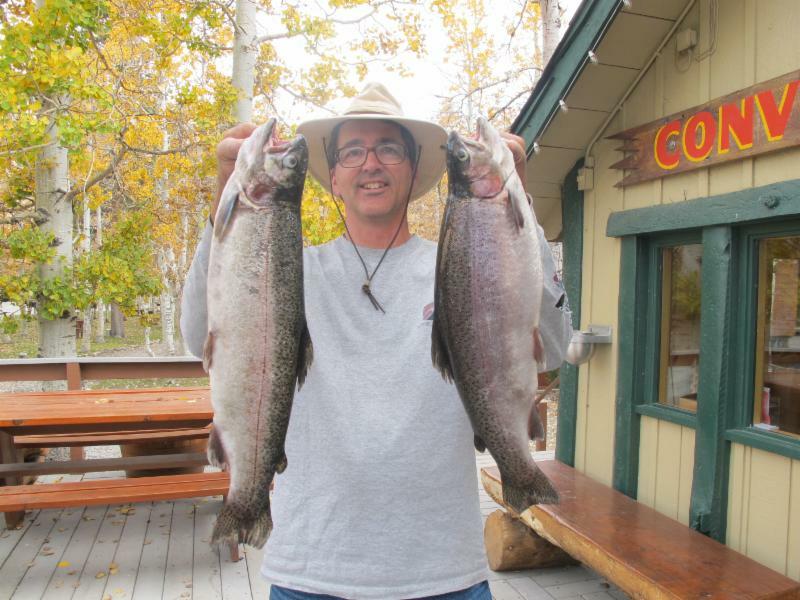 Catch of the Week: Jerry Emilo from Pearblossom, CA who stayed with us this past week, had himself a great week of fishing with his sons. 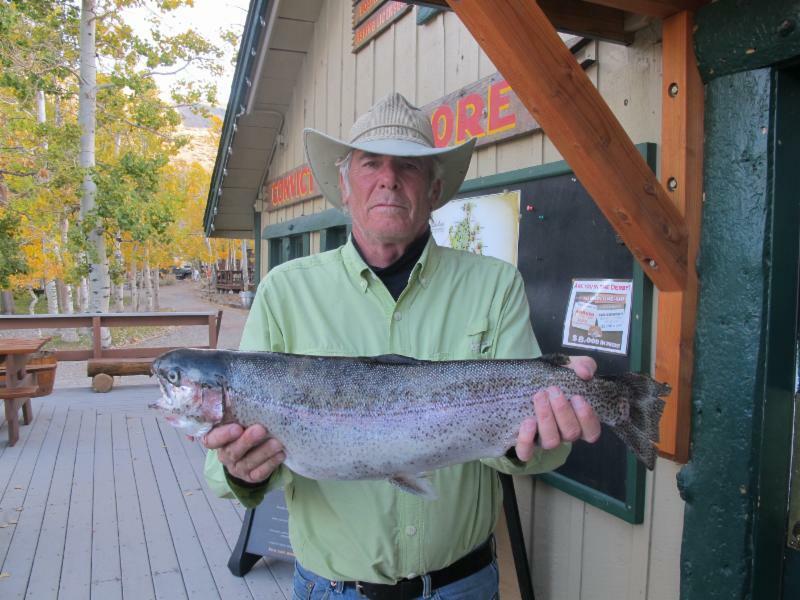 Jerry caught a fat 5 pound 3 ounce Rainbow which was the "Catch of the Week". He was using a nightcrawler and he was fishing the North Shore. The Emilo Family landed a number of lunkers during their stay. Chris Emilo's largest fish was a 4 pound 13 ounce Rainbow and Jerry Emilo Jr hooked a 3 pound 15 ounce Rainbow. Congratulations to the Emilo Crew on an impressive week of fishing! 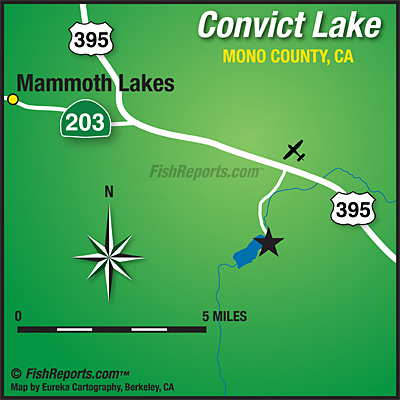 Stocking Outlook 2015: The county is scheduled to stock trophy trout the week prior to the 2015 Opening Day Weekend. The resort is planning on 5-6 trophy trout stocking next year similar to what we did this season. DFG was pretty consistent with their stocking of the lake and creek this year. I'm expecting the same next year. Tactics/Bait: Here is a list of other baits/lures that can be productive: Sierra Slammers, Tasmanian Devil, Green or brown Marvel Fly Lures, Trout Teasers, Panther Martin, NeedleFish, Rooster Tails, and Bite-on Fury Shad or Lip Ripperz Hatchery Dust on Powerbait.